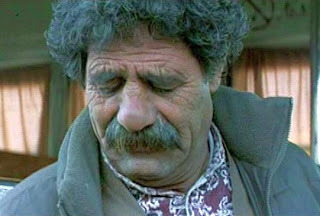 Kurdish Iranian filmmaker Bahman Ghobadi’s fourth feature film, Half Moon (Niwemang, 2006) picks up the themes and the essential narrative elements from his earlier Marooned in Iraq (2002). Again there is the story of a legendary Kurdish musician living in Iran who wishes to make the journey over the mountains into Iraq in order to perform at a concert. Again, the story of this journey is a curious mixture of local Kurdish color, broad comedy, and final tragedy. But this time Ghobadi has ventured further along his own road of personal film expression. In particular, he has moved more firmly into the realm of magical realism, similar to that popularised by Latin American writers (and occasionally used by some other Iranian filmmakers). The barbarous and unjust way women are oppressed by the laws of the Islamic Republic of Iran. In this film, he emphasizes these three themes with more vehemence and with more artistic liberties than he has done in the past. 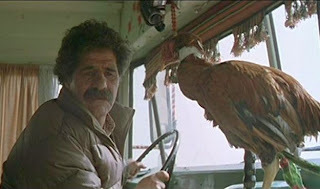 The story begins with a vivid portrayal of a cockfight in a local Kurdish village, which is interrupted when the cockfight’s ringmaster, Kako, receives a cell phone call from his father, Mamo. Mamo, we soon learn, is an aging, but still revered, Kurdish singer who wishes to travel back to Iraq in order to perform there at a concert. This will be the first opportunity in over 35 years for Kurdish musicians to perform publicly in Iraq, and Mamo has been preparing for this occasion for seven months. So he commands his offspring (there appear to be at least ten sons and a daughter) to accompany him, since they will be needed as instrumental backup musicians. Taking with them their traditional stringed and percussive instruments, they all pile onto an old school bus that they have borrowed and drive away, with Kako at the wheel. Against the warnings and concerns of his assembled sons, Mamo also wishes to bring along a woman singer, Hesho, who he says has a “celestial voice”. He manages to find Hesho in a village where she is one of 1334 women singers who have been confined there apparently because of their past singing in public. Once he gets Hesho on board, there is another problem: how can he conceal her from the Iranian authorities at the border. It is forbidden in Iran from a woman to travel on the roads with men who are not her relations. Their bus is stopped at the border, where the corrupt and thuggish border patrol soldiers search the bus for contraband and for any women (they have a dog that is specially trained to sniff for women). After a lengthy shakedown during which the soldiers trash their instruments, the musicians come to the realization that the Iranian authorities have no intention of ever letting them travel into Iraq. Nevertheless, obeying the commands of the determined Mamo, they press on and decide to taken an alternative route by travelling along the border awhile and then entering Turkey first before going into Iraq. Mamo is happy about this new route, because it will give him an opportunity to hook up with another famous old Kurdish musician and comrade, Kak Khalil. However, when they get to Khailil’s village, they learn that he has just died, and so they attend his funeral burial. When Khalil’s body is placed into the open grave, Mamo sees the dead body quiver, apparently in response to the voice of a woman singer that Mamo has heard du ring the burial. He insists that Khalil must still be alive, but he is assured by the village doctor that Khalil is indeed dead. Mamo is so disheartened by the death of his friend, that he appears to lose his will to continue. But while travelling on in their bus, the troupe encounters a mysterious, beautiful woman who announces that she will assist them in their quest to get to Iraq. It is clear that this woman, whose name is “Niwemang” (“Half Moon”) is not a being of this world and must be an angel or a Sufic spirit. Her ensuing efforts to help Mamo and his sons avoid further thuggery at the hands of the Turkish police and to get to their concert do indeed possibly achieve their goal in some higher realm – but not in this here-and-now world. Half Moon is a very uneven film, with significant weaknesses and strengths. In general, although this film when compared to Marooned in Iraq is more philosophically ambitious, it is Marooned in Iraq that was the more successful narrative telling. We have to allow Ghobadi some latitude, though, because he makes films in the most difficult conditions and circumstances. He has said that, for visual background purposes, he likes to film the Kurdish mountain scenes in the winter, but this undoubtedly makes the filming conditions more difficult. And once again, according to my understanding, he has run into problems with the Iranian authorities, and Half Moon has been banned from distribution in Iran. In the past he has been forced to spend his own money to make a film and then attempt to recoup the expenses afterwards, mostly from overseas distribution. The absolute authority and dominance of the father characters in both Marooned in Iraq and Half Moon is emphasized, often to comedic effect. Both Mirza in Marooned in Iraq and Mamo in Half Moon respect women, but both of them seem to have had many wives (in Mamo’s case I make that guess simply on the basis of his many children). Mamo’s sons, many appearing to be at least in the late 40s, are quite subservient to their father’s wishes, and on those occasions when complete obedience is not forthcoming, Mamo is quite willing to shoot his own sons with a gun. The mystical aspects of this film sit rather uncomfortably along side the brutally real conditions faced by the Kurdish travellers (and thus by the Kurdish people, in general). Throughout the film, Mamo has premonitions of his own death. For example, he is told that a local wise man has foretold his imminent death on this journey, and he has visions of his own coffin being dragged by a woman (this will turn out to be Niwemang). But these visions are rather mys terious, and they don’t contribute to an effective narrative buildup. Numbers are use in the film with probably deeper meanings, but I am not sure about their precise symbolic significance, such as , for example, the seven months that Mamo has be been preparing for the concert. I don’t know what the number 1334 might mean, but I note that a Turkish human rights commission released a report awhile ago saying that 1334 Kurdish villages have been forcibly evacuated or destroyed by ethnic cleansing operations in that country. The number 14 is discussed several times concerning whether it is lucky or unlucky. It must refer to the 14th day of the lunar month, which would be halfway through the month and therefore mark a Half Moon. Certainly the Kurdish people have yet to enjoy the radiance and splendour of a full moon shining on their fortunes, so “half moon” may be a reflection on this compromised condition. Ghobadi works very carefully with his non-professional actors, and he always gets good performances. On this occasion, the acting was even better. Unlike his previous films, which were entirely staffed by non-professional actors, he did have two top professional actresses for this film. Hedye Tehrani, a leading Iranian actress, played Hesho and also helped produce the film. 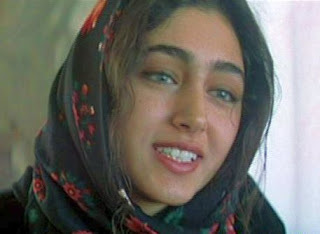 Golshifteh Farahani, who has also appeared in Boutique (2003), Bab'Aziz (2005), and Ali Santouri (2007), played Niwemang. Both of these women have the ability to convey great sensitivity and passion merely through their eyes and facial expressions. The magnificent Allah-Morad Rashtian, who plays Kako, is apparently a musician in real life, not a professional actor, but he had starred previously in Marooned in Iraq. This marvellous performer is a unique cinematic personality – there is something brilliant about him – and his presence leaves a lasting impression. I look forward to his appearance in future Ghobadi productions. Overall, the Kurdish music is the strongest and most moving aspect of the film, and I would have preferred to have more of it. A particularly strong example and the most stunning moment in the film is when Mamo retrieves Hesho from the village of 1334 women. This symbolic scene is a visual and musical master stroke – very contrived, but also stirring. It is a lso an exquisite needle with which to prick the Iranian social restrictions on women. According to Iranian rules, a woman may not sing in public, but a group of women, i.e. a women’s chorus, may perform in public. When Mamo goes to this penal colony, he is told that the women there are so skilled with their singing that they collectively sound like the voice of a single woman. And, yes, on the soundtrack for this scene, as they all sing together, we hear the voice of a single woman.